Win the ultimate getaway, your holiday, your way! The competition has now closed, thank you to everyone that entered the COLORBOND® steel Holiday Installer/Fixer promotion. There were so many interesting COLORBOND® steel tips it was difficult to pick a winner. The winning tip, ‘I use a grab stick (magnetic stick) to hold flashings when installing them. It doesn’t scratch COLORBOND® steel, won’t fall, and it only takes one person.’ came from Roof Installer Heath Martin in SA ‘When quizzed about his preference for COLORBOND® steel Heath responded with ‘I wouldn’t put anything else on my roof than COLORBOND® steel so why would I put it on someone else’s roof’. 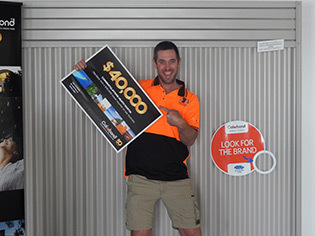 Winning the $40,000 travel voucher left Heath in disbelief and it’s only now sinking in. He is planning to enjoy it with his girlfriend and his family in the Kimberly region of Australia. We hope you will join us in congratulating our major prize winner and our minor prize winners Jason Orr TAS, William Sharrad SA, Darren Hayes VIC, Warren Kleidon QLD, Alan Thomson WA, Danny Hately ACT, Daniel Bennett NSW and David Smith NT. We wish all of our winners a fantastic holiday and look forward to seeing some great photos from their travels in Australia. And thanks again for choosing to install with COLORBOND® steel!